Chia seeds have become a trendy health food, but are they really worth the expense? A 12 oz. bag ranges from $8 to $11. This cost can put a lot of stress on the food budget. Chia seeds are tiny brown black seeds, about the size of poppy seeds. The chia plant is from the mint family, native to the deserts of Central America and Mexico. They have been a dietary staple for the Aztec and Mayans, most commonly used as an energy and hydration food for their warriors as well as a medicinal for joint and skin complaints. Aids in the elimination of carcinogens – Chia seeds are loaded with fiber. Eating enough fiber is extremely important as it aids in removing harmful carcinogens through the digestive tract. When in contact with liquid, the seeds expand forming a gel that adds bulk to your stools, preventing constipation by keeping your bowel movements regular. Protects against cardiovascular disease –Studies have shown that chia seeds lower LDL (bad) cholesterol while increasing HDL (good) cholesterol. Chia seeds are made up of 20% Omega-3s (eight times more than salmon. Omega-3s are important in lowering blood pressure and triglyceride levels as well as reducing inflammation caused by rheumatoid arthritis and other autoimmune diseases. 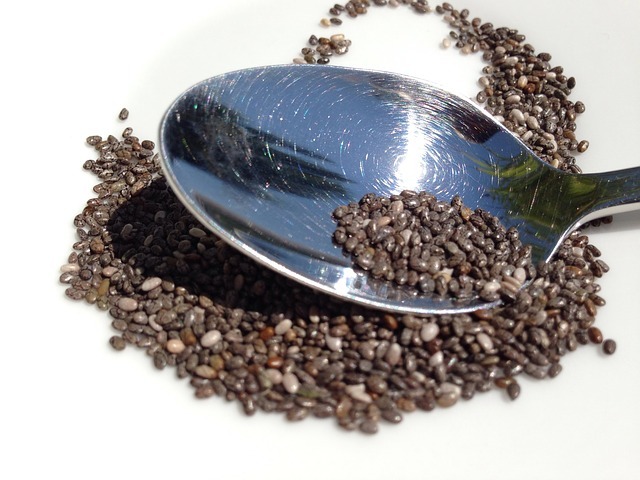 Chia seeds have also been shown to reduce plaque build-up in the arteries. Additionally, gram for gram, chia seeds contain twice as much potassium (important for regulating your blood pressure and stabilizing your heart rhythms) than a banana. Prevents against cell damage – Antioxidants are essential tools in the prevention and fight against cancer and other diseases as they protect your cells from damage. Chia seeds have three times as much antioxidants as blueberries. Supports bone health – Chia seeds are high in calcium (five times more than milk), phosphorus, magnesium and protein, all essential nutrients for bone health. 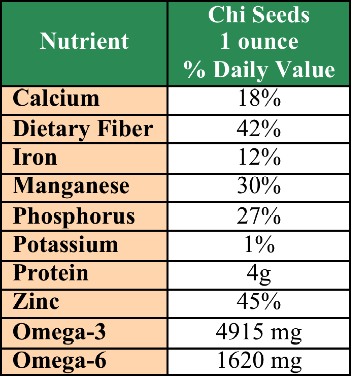 Provide high quality protein – If you consider their weight, chia seeds are about 14% protein, which is incredibly high. They also contain 19 essential amino acids, making them a wonderful plant source for protein. Simply adding a little chia in your diet can have a large impact and the seeds have a long storage life. An unopened package of chia seeds can last 2 years in the pantry or 4 years in the fridge or freezer. Ground chia lasts 2-4 weeks in the pantry or 1-2 years in the fridge/freezer. Chia seeds can be eaten whole, however, the nutrients are slightly more bioavailable if ground into a meal or sprouted (soaked overnight). Bake into bread or cookies to add a crunchy texture. Use as an egg replacer. Chia seeds become gelatinous in water. This gel-forming action is due to the soluble fiber in the chia seed. Grind 1 tablespoon of chia seeds into a flour-like consistency and soak in 3 tablespoons water for up to 5 minutes or until thick. Then add to recipe. You can also soak the seeds in water for 5 minutes to overnight without grinding for a similar effect that works just as well as an egg replacer. Make into a pudding. Try our chia seed & coconut milk pudding or chia seed, flax, hemp pudding recipes. Thicken soups and stews by soaking 1 tablespoon of chia in 3 tablespoons of water overnight. The chia will turn gelatinous and will act as a thickener when added to your soup or stew. Make chia crackers. Try Oh She Glows Endurance Cracker recipe. This entry was posted in cancer, Healing, Nutrition, Plant-based, plant-based, Recipes, Vegan, WFPB, Whole food, Whole food, plant-based and tagged alkaline foods, anticancer diet, healing disease, healthy eating, Healthy foods, heart health, Nutrition, plant-based nutrition. Bookmark the permalink. I am so glad to know chia is worth the price. Thanks for the info and recipes.